Human neuron dynamics imaged in vivo. 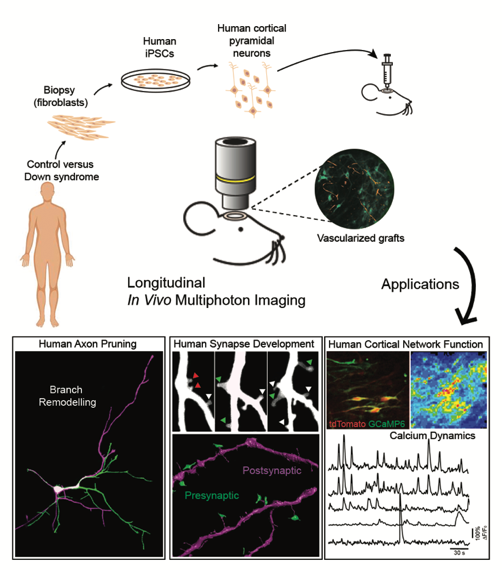 We combined human-specific genetic background with live imaging in cortical tissue grafts to investigate the earliest stages of human axon, synaptic and network activity development, and model Down syndrome. R Real, et al. Science 2018. The Synaptic Plasticity and Repair group at Imperial College London Institute of Clinical Sciences, headed by Dr Vincenzo De Paola, study the connections between nerve cells (neurons) in the brain. They investigate how the connections (synapses) between neurons are formed, maintained and lost. An area very important in understanding the functioning of the brain both in individuals who are healthy and those who have neurodevelopmental and neurodegenerative conditions. Their recent study, published in Science on 11 October, shows a new model for investigating and monitoring in real time human neuron development and function in a living brain. The research, in collaboration with a team from Cambridge University, displays differences between neuron and synapse development in healthy individuals and those with the neurodevelopmental condition Down syndrome. The loss of synapses is tightly linked to cognitive impairment in patients. In neurodegenerative disorders, such as Alzheimer’s, the loss of synapses at earlier stages is one of the first steps preceding the death of the whole neuron. It is therefore of great importance to understand how synapses work and are lost. Synapses are so small that they cannot be studied within the human brain with the current imaging methods available. Traditionally, researchers would use model organisms such as mice, flies, fish and worms, to investigate neuron and synapse development. This, however, raises the question of how well this relates to understanding the neurons in humans. The study of neurons in these model organisms, while still essential, is known to not always translate to humans and if this is the case, observations and predictions made within these traditional types of study may lose some of their impact. The inability to study human neurons in vivo has been an important problem that Dr De Paola and his team, as well as other researchers around the world, have been thinking about for a long time. Following the breakthrough of induced pluripotent stem cells (iPSCs) a few years ago, the study of human neurons in vivo was able to advance. 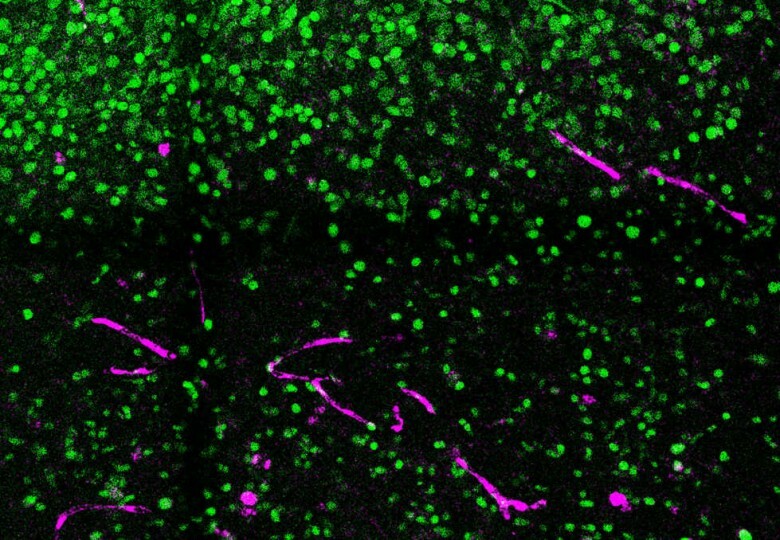 In this pioneering study, human neurons were created by reverse-engineering skin cells from two individuals with Down syndrome by co-first author Dr Manuel Peter and colleagues in Prof Livesey’s group at the Gurdon Institute. 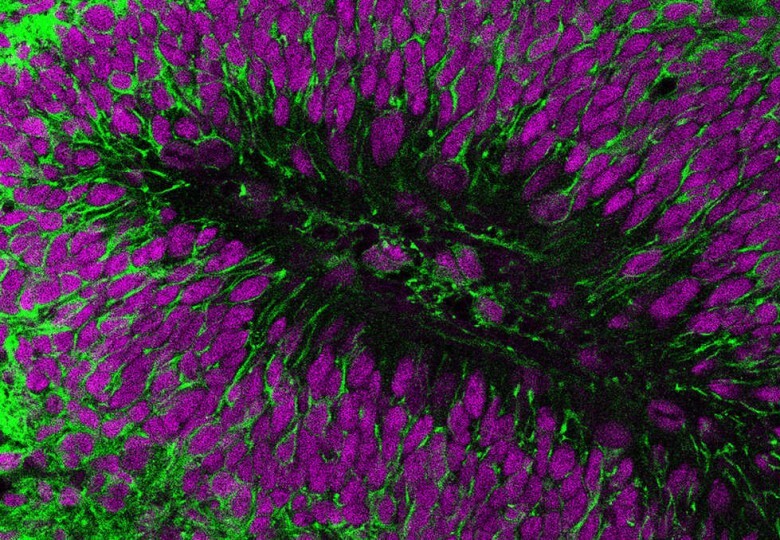 The cells were implanted in the brains of mice by co-first authors Dr Raquel Real and Dr Antonio Trabalza of Dr De Paola’s team, creating a model where the development of the neurons and synapses can be observed in real time. There were three key findings of the study: the first was that when the human neurons were transplanted connections developed with similar timing and extent to the human foetal cortex. The second, that transplanted human neurons function as expected, with spontaneously synchronised activity similar to the human foetal cortex. The third, that spontaneous neural activity is markedly reduced in individuals with Down syndrome. 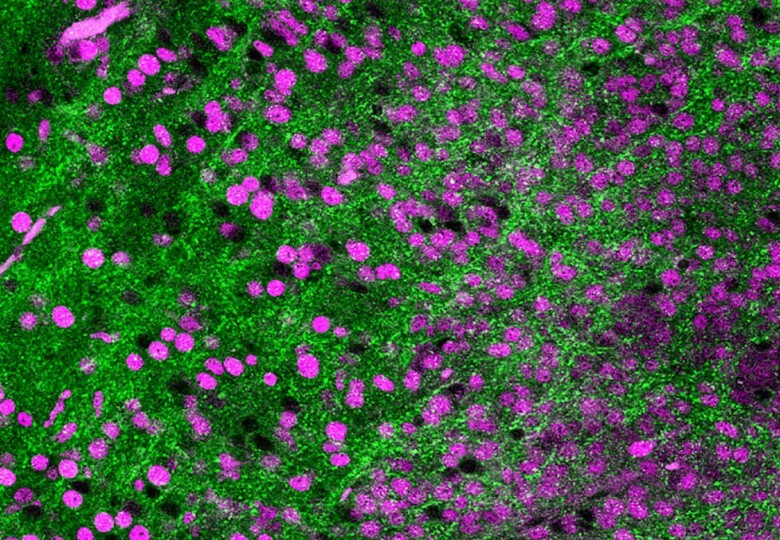 Transplanted human neurons (green) and nuclei (purple). Credit: Drs. Raquel Real, Antonio Trabalza and Vincenzo De Paola. Blood supply (purple) in transplanted human graft (green). Credit: Drs. Raquel Real, Antonio Trabalza and Vincenzo De Paola. Synaptic connections (green) in human neuron transplant (purple). Credit: Drs. Raquel Real, Antonio Trabalza and Vincenzo De Paola. The third finding, which shows clear differences in the activity of the neurons and synapses in healthy individuals and those with Down syndrome, is a very important one. The different synchronised activity may have to do with cognitive function. The team will be exploring this next, as they believe there are candidate molecules involved in the markedly reduced activity and are eager to investigate them. Raquel Real is about to complete her PhD in the Synaptic Plasticity and Repair group and has recently moved to UCL as a Clinical Research Associate in the Department of Clinical and Movement Neurosciences.